As Matt mentioned on Sunday, this amazing October weather will give way to an unsettled second half of the week across Colorado. Models have been all over the map in handling details for late this week, largely surrounding the eventual track of moisture associated with now tropical storm Simon; that said, details have now come into much better focus. Simon is forecast to move inland later today, with moisture associated with the low pushing into the southwest US by Wednesday afternoon and evening. This moisture will eventually move into Colorado Thursday into Friday. Consensus seems to be getting in line with the best chance for heavy precipitation being south of I-70 along the I-25 corridor, and east. The 00z GFS/CMC/EURO all paint a large swath of 1 - 2 inches of precipitation for this area by Saturday morning, with some of the heaviest totals forecast for the Colorado Springs area. These solutions leave Denver drier, but not dry, to end the week. In fact, the GFS which had been completely dry through the weekend for DEN is now producing a few tenths. We’ve also seen the EURO come into better agreements with its ensembles, with somewhere between 0.5 and 0.9 inches being forecast for the Denver area. Denver is not out of the woods yet for some of the heavier precipitation. We’ll need to watch the track over the next 24 hours and make any adjustments needed… But as compared to where we were 36 hours ago there is much better consensus here. Today’s 12z deterministic EURO came in pretty wet again for Denver, with totals from 1 to 2 inches across the metro area Thursday through Saturday. While the greatest threat appears to be across south and east-central Colorado -- still a lot to watch here. As for temperatures… There won’t be all that much cold air to work with associated with the moisture we’ll see. With that, expect the threat for snowfall to stick to higher elevations to the west, with rain across the plains. Temperatures will be chilly to end the week though, especially where rain does fall. 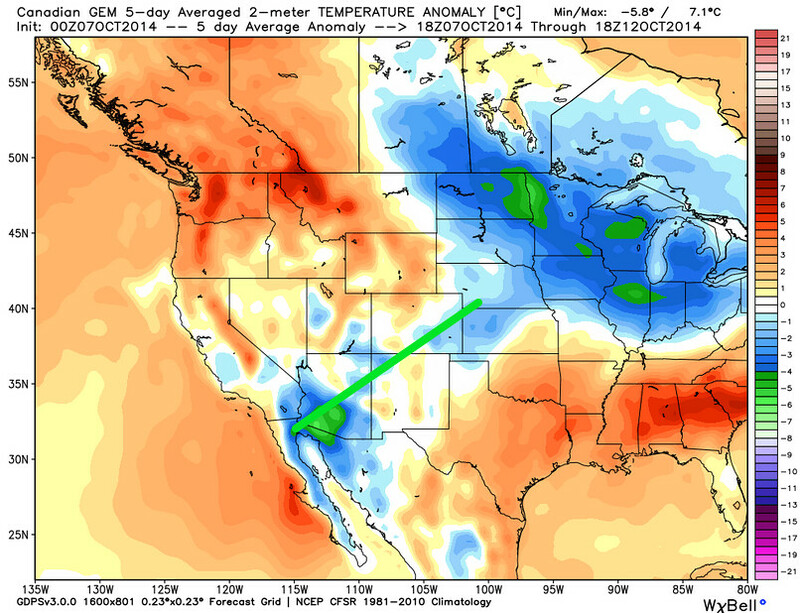 Take a look at the GEM 5-day 2 meter temperature anomalies beginning today. 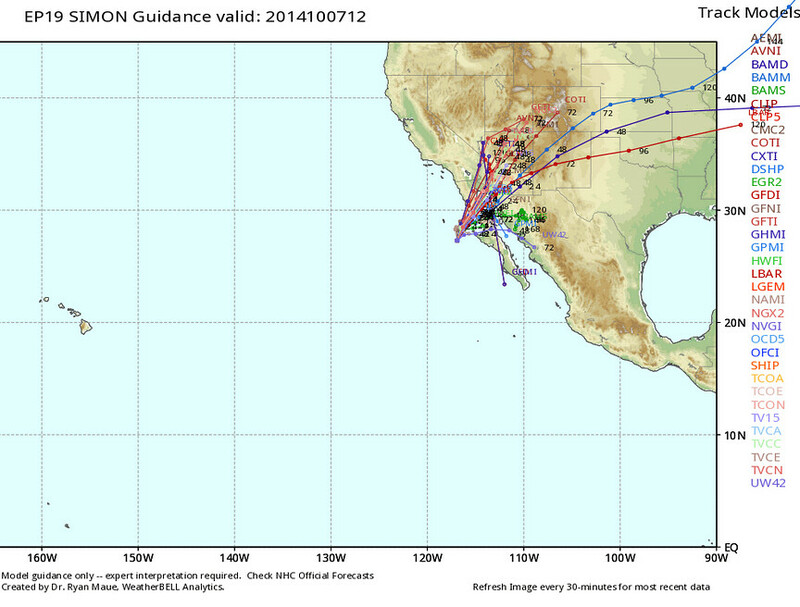 On can very clearly see the Simon connection out of southwest Arizona through southeast Colorado over these five days. Lastly… our attention then turns to the Sunday-Tuesday timeframe when a large trough could impact the region bringing with it much colder air with it than this week’s storm. Medium range models have been a complete mess lately so we won’t hang our hats too confidently on any one solution at this time. The EURO looks most interesting with its handling of this system and given its track record this has our attention. Both the EURO and Canadian are showing temperatures well below normal for Monday, while the GFS (somewhat unsurprisingly) has temperatures +8 above normal. Crazy. Needless to say, a lot to watch over the coming week. If you’re not subscribed, please do so, so we can send along forecast updates as needed. There are also a few (free!) tickets left for next week’s weather meetup, so if you’re interested in attending please signup here (and feel free to bring a friend! ).